It's 11:09 in Luxembourg, Luxembourg right now. 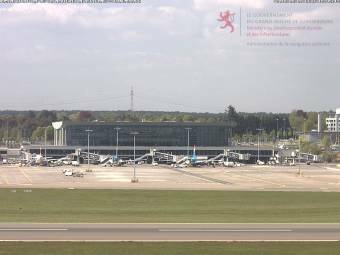 Luxembourg Airport Two webcams offer a view of the airport of Luxembourg. Medernach: Camping auf Kengert, 14.2 miles away. Apach: Apach Locks, 14.6 miles away. Mertert: Landscape View, 16.9 miles away. Mettlach: Saar Loop at Mettlach, 21.9 miles away. Trier: LDO-Cam, 25.1 miles away. Bitburg: Bitburg-Webcam, 30.6 miles away. Bitburg: View over Bitburg, 30.6 miles away. Daleiden: Weathercam Daleiden, 31.8 miles away.